Fans of the 2002 cult classic comedy Super Troopers have been waiting 13 years for Super Troopers 2, but there has been no movement on the sequel for quite some time. 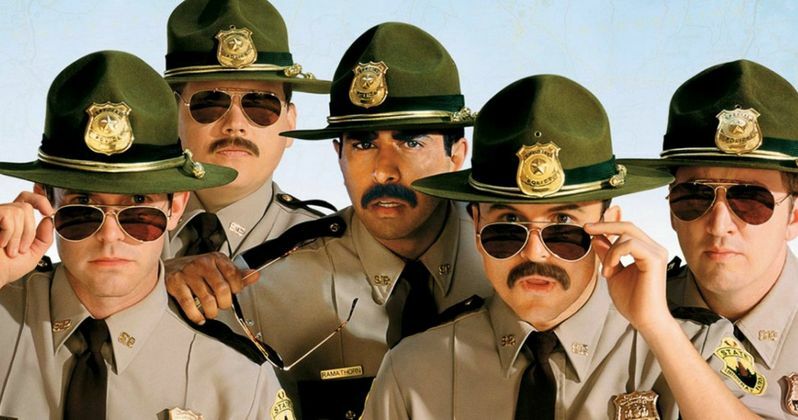 Director Jay Chandrasekhar revealed three years ago that a legal situation was holding up progress on the follow-up, but now the Broken Lizard troupe (Jay Chandrasekhar, Erik Stolhanske, Steve Lemme, Kevin Heffernan, Paul Soter) is looking to fans to help get Super Troopers 2 made through an IndieGogo campaign. The filmmakers/stars are seeking $2 million to get their sequel off the ground, with Fox Searchlight agreeing to distribute the movie if they can raise the money themselves. Take a look at part of Broken Lizard's statement on the IndieGogo campaign page, adding that production will begin this summer if they meet the $2 million goal. "We've been waiting for years to do this, and meow the time has come. Our mustaches are thick, furry, and authoritative. The script is written and we're getting all antsy in our pantsy to start shooting. There's just one problem: While the studio has given us permission to make the sequel, and agreed to distribute it (at least in the USA and Canada), we need to fund the movie ourselves. So this is how it works: if we're able to raise at least $2,000,000 in the next month, we'll be able to get to work on a barebones version of Super Troopers 2 this summer. But $2,000,000 is the bare minimum we'll need to get into production. We've got some big stuff in the script, and if we're able to raise enough money, you'll get to see all of it. The more we raise, the more amazing stuff we can put in the movie. More action, more cameos, more shenanigans, and fine, more Farva." The IndieGogo site also lists a number of perks fans will get for contributing. Fans will get a digital copy of their shooting script for just $10, and for the one lucky fan who donates a whopping $35,000, they will get to keep the patrol car used in the sequel. Other perks include a VIP premiere experience in New York City for $1,250, a chance to compete in the first annual Beerfest tournament in Chicago for $2,500 and the chance to attend a baseball game with the entire Broken Lizard crew for $15,000. Broken Lizard has also released a brief video where Jay Chandrasekhar, Erik Stolhanske, Steve Lemme, Kevin Heffernan, Paul Soter all reprise their roles from Super Troopers while explaining their crowdfunding campaign. After just four hours of the campaign going live, over $375,000 has been raised, so it seems likely this sequel could be fully funded very soon. Check out the Broken Lizard video below, and CLICK HERE to learn more about the campaign and check out the rest of the perks for yourself.